The view covers about 230 degrees of terrain around the rover. Spirit's panoramic camera (Pancam) took 72 separate images of this scene with four different Pancam filters. This is an approximately true-color rendering using the Pancam's 75-nanometer, 535-nanometer, and 432-nanometer filters. 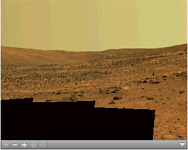 Image-to-image seams have been eliminated from the sky portion of the mosaic to better simulate the vista a person standing on Mars would see.